The world's largest and most profitable companies?including the likes of GE, Bank of America, Honeywell, DuPont, Samsung, Starwood Hotels, Bechtel, and Motorola?have used Six Sigma to achieve breathtaking improvements in business performance, in everything from products to processes to complex systems and even in work environments. Over the past decade, over $100 billion in bottom-line performance has been achieved through corporate Six Sigma programs. Yet, despite its astounding effectiveness, few outside of the community of Six Sigma practitioners know what Six Sigma is all about. With this book, Six Sigma is revealed to everyone. You might be in a company that's already implemented Six Sigma, or your organization may be considering it. You may be a student who wants to learn how it works, or you might be a seasoned business professional who needs to get up to speed. In any case, this updated edition of Six Sigma For Dummies is the most straightforward, non-intimidating guide on the market. 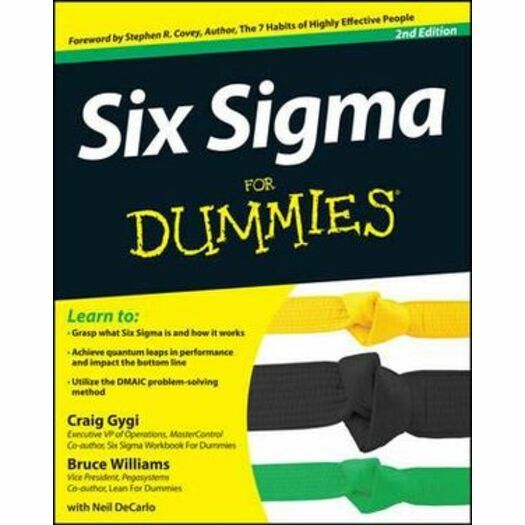 Six Sigma For Dummies will become everyone's No. 1 resource for discovering and mastering the world's most famous and powerful improvement tool. Stephen Covey is spot-on when he says, "Six Sigma For Dummies is a book to be read by everyone."